How many players can play Gears of War 4 locally (couch co-op)? How many players can play Gears of War 4 via system link or LAN? How many players can play Gears of War 4 online? What direction is the screen split in couch co-op for Gears of War 4? Does the PC version of Gears of War 4 support split screen play? How do you begin a co-op session in Gears of War 4? How does save game progress work for co-op play in Gears of War 4? Can I join a game if the host is further along than me in Gears of War 4? What does the Gears of War 4 season pass get you? Is combo co-op available for cross platform play? What is Gears of War 4 play anywhere? Is combo co-op supported for Horde? Is is possible to play Horde mode entirely offline? Can I use the same Microsoft account on my PC and Xbox One to play the Gears campaign and/or Horde mode in co-op? Two players can play the campaign mode in couch co-op for both the PC and Xbox One versions. Horde mode supports couch co-op for the Xbox One version, but not on PC. True LAN or System Link play is not available in Gears of War for the cooperative modes. Two players can play the campaign together online while five players can play the cooperative Horde 3.0 mode. Combo co-op is only supported on the Xbox One version of the game, and only in the Horde mode. Horde mode supports up to 5 players total, so two local players could team up with three other players online, or two groups of local players could team up with a fifth online. Does the PC version of Gears of War 4 support split-screen play? Yes, Gears of War 4 on the PC supports split-screen gameplay, but for the campaign only. When choosing campaign you'll choose the local or online option under Co-Op. Horde mode allows you to create private lobbies or play publicly in match making. All players earn progress and achievements. You may unlock Acts based on progress when you aren't the host. The season pass is primarily focused on Gears of War 4 versus gameplay. VIP Vintage Pack -- Vintage JD character skin, vintage Gnasher and Dropshot weapon skins, vintage JD emblem, and vintage JD bounty that gives you extra XP. Permanent DLC map ownership for 24-plus maps -- At least two per month for 12 months for private play on dedicated servers. Developer Playlist -- This lets you play upcoming modes, maps, and variants before they are released publicly. Six Gear Packs -- These let you unlock character and weapon skins, as well as equipment and abilities, along with bounties that offer extra XP. Is combo co-op available for cross-platform play? Yes, but only on the Xbox One. A pair of players on Xbox One can play Split-Screen Horde mode with players on the PC or Xbox One. If you purchase the digital version of Gears of War 4 you can play it on your Xbox One or Windows 10 PC. Your save progress is automatically sync'd between the console and PC so you can start on one platform and pick up on the other. 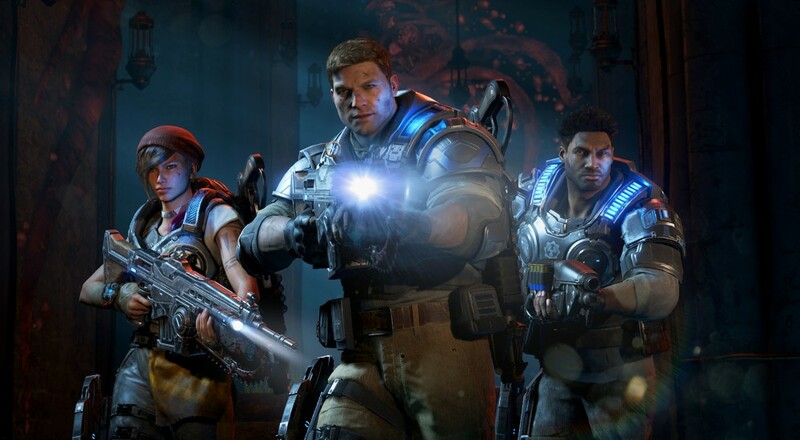 Players can play Gears of War 4's co-op modes with players on any platform. This feature works on all game modes. Cross-platform play is still supported if you purchased the physical version of the game, but you can only play the game on the platform for which you bought the disc (i.e., only on the PC or Xbox One). Combo co-op for Horde 3.0 only works on the Xbox One. No. If you have the digital version you're going to need to be online to play any of the multiplayer modes. Can I use the same Microsoft account on my PC and Xbox One to play the Gears campaign and/or Horde mode in co-op? For example, I play the game on the PC while my friend uses my account on the Xbox One to play? No, this isn't possible. Only one instance of an account can be active on Xbox Live at a time.